Price: $26.95 Hardback $22.95 Paperback (Please scroll down to purchase). ebook available at Amazon for only $9.95 or at Barnes and Noble. My book entitled “Committed to Love” is a deeply personal one. It details the many issues and experiences I had to confront and deal with in my twenty-five-year marriage to a bisexual man who succumbed to AIDS. The twenty-four chapters in this book range from his diagnosis on June 19, 1992, with AIDS-related pneumonia to his death on August 17, 1994. Every aspect of my relationship with Dr. Jeffrey A. Mintz, both as my best friend of thirty-seven years and my husband of twenty-five is explored in explicit detail. The challenge of a marriage under these circumstances was, to say the least, both chaotic yet most rewarding. As I wrote and rewrote this introduction, many of my thoughts about love evoked images of champagne, roses, and chocolates. Yes, I had a lot of all of them in my marriage to Jeff, but the reality and truth of my life with him was that the word love for me had always meant commitment, unconditional acceptance, and facing every problem with a solution even if I didn’t know what the solution would be or if it was the right one. Price: $22.95 Paperback only (Please scroll down to purchase). I will tell you about hospice, the love I have for this organization, and what it did for me. Hospice is everything right in life when everything is wrong. When life and every aspect of it are out of control, hospice manages the chaos and turmoil. Hospice is a “team” effort. After my husband died, I wanted to join this team to help others going through a Hospice situation. “Team Hospice” rallies around the “family unit” and assists during this critical time. I know all too well what these families are going through and how they feel. I have walked this path and I want to tell them they are strong. They will get through their grief in time. 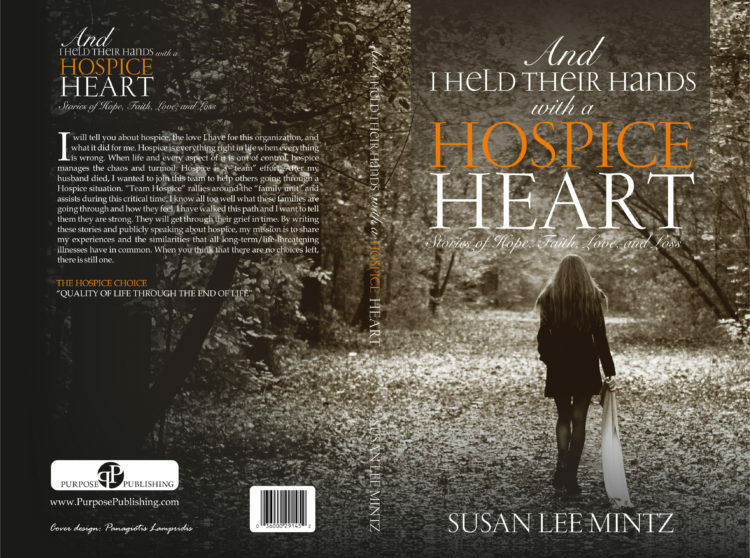 By writing these stories and publicly speaking about hospice, my mission is to share my experiences and the similarities that all long-term/life-threatening illnesses have in common. When you think that there are no choices left, there is still one. Hardback and paperback books can be ordered directly from this page using the Payment Form below. ebook details are listed under each book above. For bulk orders of 25 or more @ $12 each, orders can be placed with the publisher, Purpose Publishing or by clicking here.